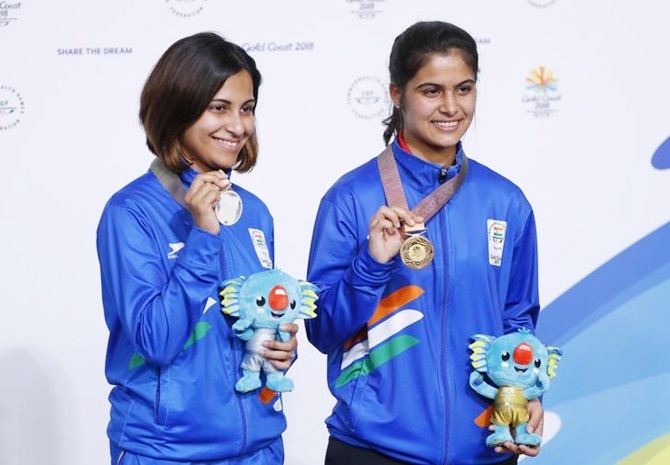 India's 16-year-old shooting sensation Manu Bhaker comfortably won gold in the women's 10 metres air pistol event as Heena Sidhu staged a remarkable recovery to secure silver at the 21st Commonwealth Games, in Gold Coast, on Sunday. Bhaker's unwavering concentration belied her age as she calmly aggregated 240.9 points to break the Commonwealth Games record and finish well ahead of her senior teammate Sidhu, who aggregated 234. The bronze medal went to Australia's Elena Galiabovitch, who ended with 214.9. The sharpshooter from Haryana made a memorable debut in the Commonwealth Games, setting a new Games record in the qualifying session with a score of 388. The previous Games record for qualifying was 386, set by Australia’s Dina Aspandiyarova, in Melbourne, in 2006. Two series of 98 each were followed by another two of 96. Sidhu qualified in second place despite scores of 94 and 93, finishing with a total of 379. Bhaker was the overwhelming favourite in the event, having bagged gold medals at the 2018 ISSF World Cup in Guadalajara, Mexico and the following Junior World Cup in Sydney. Sidhu too did well to win silver after being on the verge of elimination at one stage. She won a silver at the Delhi Games in 2010 too.